Buy or lease the new 2018 Nissan Rogue Sport to experience everything it has to offer. This fuel-efficient Nissan SUV includes family-friendly amenities, advanced technology options and a host of intuitive safety features. Test-drive the 2018 Nissan Rogue Sport at our Nissan dealership near Minnetonka, MN, to see why you should take it home today. The standard 2.0-liter 4-cylinder engine generates 141 horsepower and returns up to 32 highway mpg, keeping you cruising past the pump for miles and miles. The Xtronic CVT® with manual shift mode gives this Nissan SUV sportier performance, and the available Intelligent All-Wheel Drive system will have you well prepared for any adverse weather or difficult road conditions. As you conquer the roads of Minnesota and beyond in your new Rogue Sport you can relax with tech amenities such as an available 7-inch color touchscreen and standard Bluetooth® wireless technology. Once you fasten your seatbelt and press your foot to the accelerator you can drive with peace of mind thanks to the host of safety features that are available in the 2018 Nissan Rogue Sport. Upgrade to include Nissan Intelligent Mobility to gain driver-assistive features like Intelligent Cruise Control, Automatic Emergency Braking with Pedestrian Detection and more. Other safety features like Rear Cross Traffic Alert can give you a second set of eyes so you can remain aware of any potential hazards. 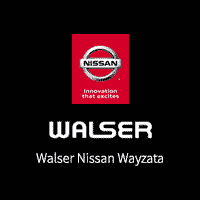 When you buy from Walser Nissan Wayzata you’ll be treated like family. Our Walser experts will help you through the entire financing process, and our Upfront Pricing ensures there’s no wondering as to what the final price of your vehicle will be. Visit our Minnesota Nissan dealership to browse our inventory and test-drive the 2018 Nissan Rogue Sport today.